…and filled with Nava’s delightful illustrations. …that take less than 45 minutes (and often less than 30) to prepare. A pantry supply list tailored to the recipes in the book. The best and easiest chocolate frosting ever! Crazy low price at Amazon. The book will be released in exactly 3 weeks, but you can pre-order yours today. But if you want more evidence, check out a few of the book’s recipes on the web. 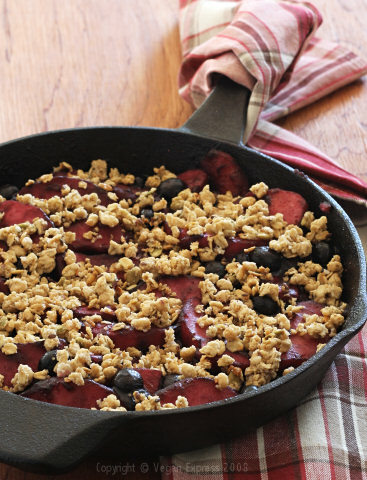 Nava has gone back to blogging, and the Berry-Apple Skillet Crumble pictured above is her current Recipe of the Week. 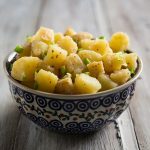 Also be sure to check out the two recipes previously posted here, Pasta with Roasted Vegetables and Olives and Sweet and White Potato Salad with Mixed Greens. Probably what I like best about this book is that it is busy-person tested. 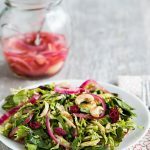 Nava wrote it while raising a family and working on her graduate thesis, a sure sign that these recipes fit right into a hectic lifestyle. They could easily fit into yours! Wow, I love love love your food pics. Hm, looks like I should get a copy of this book :-). Okay, SO pre-ordering. Thanks for posting about it! I can’t wait to get my copy! Hi, I’m new around here. And, I’m really enjoying your beautiful blog. It’s lovely to look at and full of fantastic information and recipes. I’ll certainly be trying some out. Congratulations on the pictures in the book. I will take to heart your very soundn reasons for purchase and check it out. Thanks! Okay Susan, you have OFFICALLY convinced me! You should really think about writing for amazon! You could probably sell snow to a snowman with a list like that. I mean, you only keep up a famous blog, are a wife, a mother a photographer, and I’m sure do eight thousand other things in the run of the day, so I’m sure you’d have the time! ;)hehe. Congrats on your beautiful work, I can’t wait to see all the photos, and cook all the food! Thank you, Susan. I can’t wait to see your beautiful photographs alongside Nava’s wonderful recipes! Your encouragement is very welcome. I don’t like to buy cookbooks sight unseen but hope they get it in the local bookstores – I recently bought Nava’s soup cookbook and after looking around for a good veg soup cookbook this is the one for me, so will be interested in her new book. Thank you for the great review! 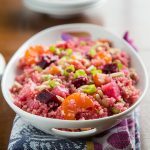 I am excited to not only try her new recipes, but see your great photography as well. I still can’t believe that you post all of your recipes, nutritional information et al, and the photos that accompany them are amazing. In fact, I think the next time you photograph for a cookbook, you should insist on taking a photo of every recipe. Those are the only cookbooks I buy, because I need a visual representation of what it is I’m trying to make, especially on first-time recipes. Your photos are indeed beautiful enough to warrant the extra pages. Insist on it!!! this is so exciting!! I can’t wait to see a copy of the book!! Congrats on the book! Very exciting. I think I might have to get the book because that looks amazing! I have to say that I really love being a subscriber of your blog <3 Should have done it sooner! My name is Isabelle and I'm a member of the WEGO Health Community [http://www.wegohealth.com]. I’ve been spending some time on your site and because of your involvement in the vegetarian and vegan communities, I wanted to get in touch with you to let you know a little bit about what we're doing here at WEGO Health. We are a new health website with a growing nutrition community. Our mission is articulated nicely here [http://www.wegohealth.com/our-mission.html]. I really think our members would enjoy your site and I’m wondering if you would be interested in introducing yourself and your blog via our message boards? 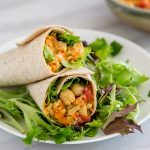 Our community has a great deal of interest in vegetarian and vegan diets and I think they would love to hear your thoughts and learn about your experiences. Many members of our community have already shared their questions and experiences with the various forms of vegetarianism on this thread [http://forums.wegohealth.com/forums/viewthread/129/]. Thanks in advance for checking out our site and I hope to hear from you soon. Okay, Susan, looking at your blog today cost me some money! 🙂 I pre-ordered the book through your site. Can’t wait! I didn’t know Nava was back to blogging again. That’s great to hear! Your photo is very nice, I’m sure the whole book will also be. thanks for talking about it. Beautiful photograph, Susan! I can’t wait to get my copy. Yay. Thanks for the tip. Also, the berry apple skillet was totally spot on (and I didn’t even use any added sugar and used Bear Naked fit, which is very low in sugar). drool! Ok, I am officially too stupid to find the recipe on her website, but after flipping through the preview at amazon(.de) I will get the book. And honestly, if I was her, I’d have my publisher check with amazon, because they really let you see MANY pages! Julia, she’s completely overhauled the website recently, so it’s probable that she hasn’t gotten this one re-posted. So, you found it in the preview at Amazon? That’s good to know, but I agree that they probably should not have the whole book available.